In the countryside, in a village. Enjoy the charm of the countryside 5 minutes from the sea, the landing beaches and the historic center of Bayeux. 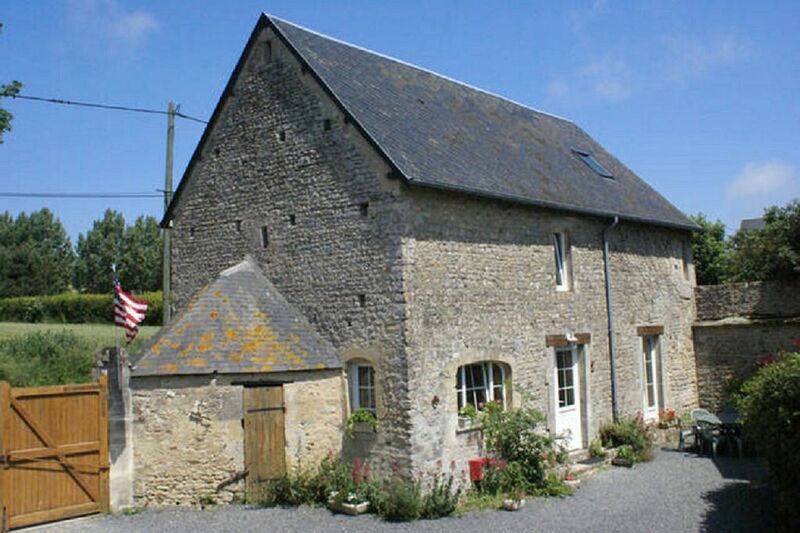 Restored in a farmhouse typical of Bessin, this old farmhouse offers a rustic and authentic charm. Spacious, it is an ideal setting for your family vacation. This house is independent. It is close to our house and another cottage. We chose to keep a countryside spirit at this old farmhouse that does not deny its past. It is a comfortable, authentic house with a rustic character. It has been converted into this style with antique family furniture, purchased in the auction room or flea market. -R-d-c: kitchen, living room, lounge with armchairs and sofa, wc. -Stand 1: 3 bedrooms (1 double bed 140x200, 2 single beds 90x190 90, bunk beds), 3 bathrooms with toilet. -Stage 2: 1 room in mezzanine with access ladder of miller (2 beds 1 person 90x190). Central heating. Washing machine. Dishwasher. TV. DVD. The yard is common and can be completely closed by a gate. Animals accepted. Dogs on a leash in the yard. Pets are not allowed on the sofa and on the beds. Thank you for providing a blanket or basket. This farm house is not a luxury house but comfortable. This is an old cider press room, part of a complex of buildings and houses that are now being used as a garage and storage space. All entries to the court yard. This is a very secure place with privacy. There are 2 bathrooms and another bathroom accessible to all on the second floor. All 3 bathrooms have shower stalls with no bath tub. One will find an additional restroom with toilet and sink on the ground floor. Kitchen is small but it is located on a corner with large windows facing 2 direction where one can look out to a small yard, with a large round table, available to guests and to the right to wide public access short yard. We enjoy meeting and welcoming people from everywhere. We are readily available to assist and answer any questions you may have, given we live right next door. We do our best so that you feel perfectly at home, respecting your quiet time and privacy. It is a quick drive to Bayeux, which is a lovely town and well worth exploring. The drive to Omaha beach and the American cemetery is also quick and easy. Liebevoll eingerichtetes Häuschen. Sehr viel Platz. Alles Nötige vorhanden. Freundliche Gastgeber in, die jederzeit ansprechbar war. Hervorragender Ort, zum Ausruhen und Erholen. Nous avons passés de bonnes vacances, notre lieu de séjour étant très bien. Merci pour votre commentaire. Nous vous souhaitons une bonne continuation. Fijn huis en aardige gastvrouw en gastheer. Nous vous remercions pour votre commentaire. A une autre fois peut-être.